← PETA Joins Forces With HUNTERS! Great No Kill Movie, “Redemption”, Now Available on DVD! 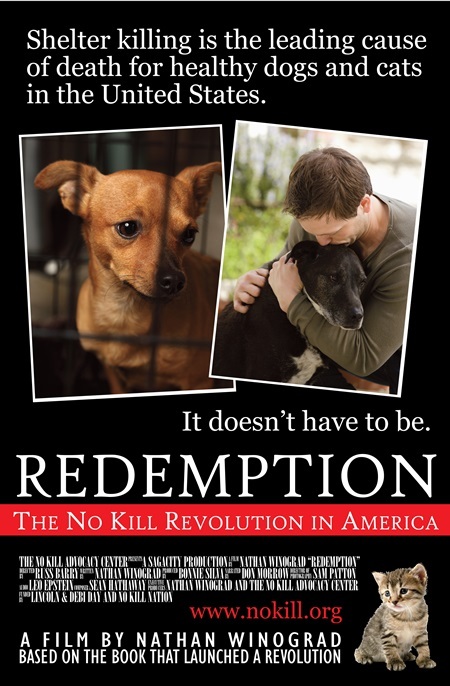 Posted: June 16, 2015 | Author: SiameseCatTwins4Ever | Filed under: Uncategorized | Tags: No Kill Movie, Saving Shelter Pets |Comments Off on Great No Kill Movie, “Redemption”, Now Available on DVD! A great movie about the No Kill Revolution is now available on DVD. The movie, Redemption, can be purchased by going to http://www.nokillredemption.com and clicking the “Purchase” option. Or just go to http://www.amazon.com and search for “Redemption”, or “Redemption, No Kill” and you can purchase it there. You may want to buy an extra copy or two (The DVD is only $9.99) and send it/them to your local shelter, Mayor, City Council Members, and your library to educate your community regarding the fact that a choice..a BETTER, HUMANE and ETHICAL choice (as opposed to the inhumane, unethical, cruel choice to kill shelter pets) is available….one that will SAVE the precious lives of beautiful shelter pets! The choice to GO NO KILL! Dont miss out on witnessing the movie that the pet murderers at PETA tried to censor! Get your copy of “Redemption” on DVD, at Amazon.com, today!